It’s been a long time coming, but Genesis is finally launching its first-ever SUV, which should help boost the luxury automaker’s sales considerably. Previewed by a slick-looking concept at the 2017 New York Auto Show, the GV80 is expected to go on sale in 2020. We’ve already seen camouflaged prototypes being put through their paces, but this render posted by Kolesa.ru gives us a better idea what the GV80 will look like when the covers come off. We can only hope the production model will look as good as this. While the GV80 isn’t expected to go on sale until 2020, we could see the luxury SUV debut later this year. 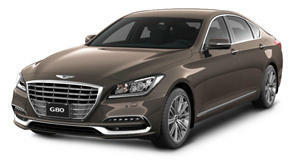 Expect it to cost more than the current Genesis G80 sedan, which starts at $42,050. After the mid-size GV80 launches, a smaller GV70 is expected to follow as a rival to the BMW X3, Audi Q5, and Mercedes GLC.